How did I spend one of my last summer Fridays*? 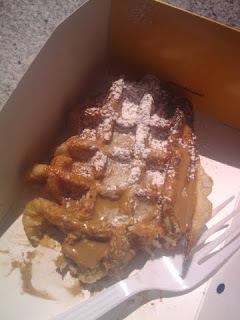 I finally went to the Wafels & Dinges truck! And wow. I only wish I had gone AGES ago! I ordered the liège wafel with spekuloos spread. I had NO idea what the hell spekuloos spread was and I didn't ask - but the board said it was their favorite so I just went with it. Oh, man. The Wafels & Dinges website says "Spekuloos is a spread that looks like peanut butter, but it tastes like traditional Belgian gingerbread-cinnamon cookies. It beats Nutella 10 to 1." And I have to agree with them. Adding to the experience is how cute and cheeky the guys in the truck are (what is it with gourmet food trucks in the city being operated by incredible flirts?!). When I said I wanted a liège wafel, cutie guy working the truck says, "Avec quoi?" I answered, "Avec spekuloos, bien sûr." Need further proof that these guys are awesome? They hosted a Miss and Mister Wafel competition this past week! Want to make wafels yourself? The website has the goods. Can't wait to go again - they're going to give Schnitzel & Things a run for their money in my own personal Favorite Food Truck competition! Eat, drink, and danke schoen for the excellent wafels! * Bless publishing and their half-day Fridays in the summer! Must. Go. Back. To. Belgium. Beer, waffles, chocolate. Checkmate. Perfect country. I am finding it TRAGIC that you did this while I was out of town!! Must. Go. Next. Time.